As already mentioned, Conduction and Breakdown in Commercial Liquids are not chemically pure and have impurities like gas bubbles, suspended particles, etc. These impurities reduce the breakdown strength of these liquids considerably. The breakdown mechanisms are also considerably influenced by the presence of these impurities. In addition, when breakdown occurs in these liquids, additional gases and gas bubbles are evolved and solid decomposition products are formed. The electrode surfaces become rough, and at times explosive sounds are heard due to the generation of impulsive pressure through the liquid. These are explained briefly below. This force is directed towards areas of maximum stress, if ε2 > ε1, for example, in the case of the presence of solid particles like paper in the liquid. On the other hand, if only gas bubbles are present in the liquid. i.e. ε2 > ε1, the force will be in the direction of areas of lower stress. If the voltage is continuously applied (d.c.) or the duration of the voltage is long (a.c.), then this force drives the particles towards the areas of maximum stress. If the number of particles present are large, they become aligned due to these forces, and thus form a stable chain bridging the electrode gap causing a breakdown between the electrodes. If there is only a single conducting particle between the electrodes, it will give rise to local field enhancement depending on its shape. If this field exceeds the breakdown strength of the liquid, local breakdown will occur near the particle, and this will result in the formation of gas bubbles which may lead to the breakdown of the liquid. The values of the Breakdown in Commercial Liquids containing solid impurities was found to be much less than the values for pure liquids. The impurity particles reduce the breakdown strength, and it was also observed that the larger the size of the particles the lower were the breakdown strengths. vapourization of the liquid by corona type discharge from sharp points and irregularities on the electrode surfaces. where σ is the surface tension of the liquid, ε1 is the permittivity of the liquid, ε2 is the permittivity of the gas bubble, r is the initial radius of the bubble assumed as a sphere and Vb is the voltage drop in the bubble (corresponding to minimum on the Paschen’s curve). From this equation, it can be seen that the breakdown strength depends on the initial size of the bubble which in turn is influenced by the hydrostatic pressure and temperature of the liquid. This theory does not take into account the production of the initial bubble and hence the results given by this theory do not agree well with the experimental results. This is shown in Fig. 3.6. Another mechanism proposed to explain breakdown under pulse conditions is thermal breakdown. This mechanism is based on the experimental observations of extremely large currents just before breakdown. This high current pulses are believed to originate from the tips of the microscopic projections on the cathode surface with densities of the order of 1 A/cm3. These high density current pulses give rise to localised heating of the oil which may lead to the formation of vapour bubbles. The vapour bubbles are formed when the energy exceeds 107 J/cm2. When a bubble is formed, breakdown follows, either because of its elongation to a critical size or when it completely bridges the gap between the electrodes. In either case, it will result in the formation of a spark. According to this mechanism, the breakdown strength depends on the pressure and the molecular structure of the liquid. For example, in n-alkanes the breakdown strength was observed to depend on the chain length of the molecule. This theory is only applicable at very small lengths (≤100μm) and does not explain the reduction in breakdown strength with increased gap lengths. In Conduction and Breakdown in Commercial Liquids where minute traces of impurities are present, the breakdown strength is determined by the “largest possible impurity” or “weak link” On a statistical basis it was proposed that the electrical breakdown strength of the oil is defined by the weakest region in the oil, namely, the region which is stressed to the maximum and by the volume of oil included in that region. In non­uniform fields, the stressed oil volume is taken as the volume which is contained between the maximum stress (Emax) contour and 0.9 Emax contour. 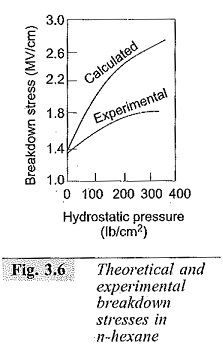 According to this theory the breakdown strength is inversely proportional to the stressed oil volume. The breakdown voltage is highly influenced by the gas content in the oil, the viscosity of the oil, and the presence of other impurities. These being uniformly distributed, increase in the stressed oil volume consequently results in a reduction in the breakdown voltage. 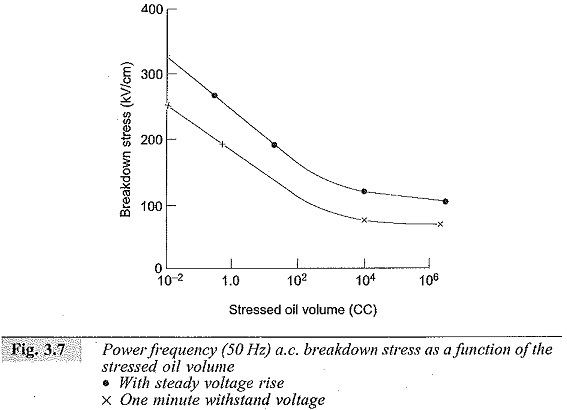 The variation of the breakdown voltage stress with the stressed oil volume is shown in Fig. 3.7. From the study of the above theories which attempt to explain the Conduction and Breakdown in Commercial Liquids, it is clear that no single theory can explain all the experimental observations satisfactorily. Therefore, recently developed fast optical techniques have been widely used to study the processes of liquid dielectric breakdown. After a thorongh analysis and review of the data with the use of optical techniques, it is now clear that the understanding of the mechanism of liquid breakdown has advanced tremendously. n = constant, always less than 1. The breakdown voltage also depends on the nature of the voltage, the mode in which the voltage is applied, and the time of application. The above relationship is of practical importance, and the electrical stress of a given oil used in design is obtained from this. During the last ten years, research work is directed on the measurements of discharge inception levels in oil and the breakdown strengths of large volumes of oil under different conditions. It may be summarized that the actual mechanism of breakdown in oil is not a simple phenomenon and the breakdown voltages are determined by experimental investigations only. Electrical stresses obtained for small volumes should not be used in the case of large volumes. Table 3.4 gives the typical breakdown strengths for highly purified liquids and the design stresses actually used. A factor of safety of about 10 is used as can be seen from the data in the table. The reasons for such an approach can be understood from the various factors considered in the breakdown theories discussed. In the next 20 years, transformer oils, which are derivatives of petroleum crude, may be in short supply. Therefore, various synthetic insulating oils have been examined as potential insultants in high voltage apparatus. Among the synthetic oils, polybutane liquids have been used for some years in cables and paper capacitors. They are superior to transformer oils in various electrical properties including dielectric strength. Fluorocarbon and silicone liquids are also used in special apparatus. In recent years, new liquids, such as high temperature hydrocarbon oils, tetrachloroethylene and tetrafluoropolyether have been successfully used as liquid dielectrics in high voltage apparatus. However, their wide spread use will require further evaluation of their properties.